Contrary to popular belief, filtering through stationary or slow-moving traffic is not illegal. In fact, one of the many attractions of riding a motorcycle is the ability to get through traffic quickly and safely by filtering, which is a fundamental skill learned by most motorcyclists. 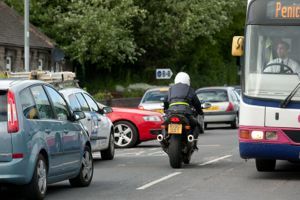 There’s no specific guidance to filtering in The Highway code but it is abundantly clear that motorcyclists can be expected to filter and that other road users need to be aware of this and take necessary action, such as checking mirrors and blind spots regularly, to avoid colliding with motorcyclists proceeding safely through traffic. However, you can be sure that a motorist who has collided with a filtering motorcyclist - and their insurance company - will argue that the accident was entirely the fault of the motorcyclist. To challenge such ill-founded allegations, it’s to your advantage to have an expert motorcycle accident lawyer on your side. Below are examples of how the Courts approach the issue of filtering.